"It took us an hour and a half in those days to drive just from Rhododendron to Government Camp"
"How's the road?" That was the question that was most frequently asked of us who drove the motor stages over the old road to Mount Hood. It was a question that had to be answered differently to different people. If it were asked by an "oldtimer" who knew the road well, the answer was a simple "good" or "bad." If the questioner was a stranger, one had to find out what he considered a "bad" road to be. If he were a person used to mud and dust, corduroy and plank, bumps, sand and rocks, with trees here and there that nudged in close to the ruts, it was easy to give him an idea of the conditions that prevailed for the particular day. If he were not used to such things, it was far wiser to change the subject, else you might lose a passenger before ever getting started." This is how Ivan M. Woolley describes driving to Mount Hood from Portland. His first road trip from Portland to Mount Hood was with Bert Higley in his 1909 Peerless. The followin year, during summer breaks from college, Mr. Woolley's acquired a job as a driver for a commercial car service. In those days, most visitors would not drive their own vehicle on this somewhat sketchy road; they hired a driver. And only the adventurous even made their way to the mountain. It could be a multi-day trip, with the first day's drive from Portland to Sandy and the 2nd day's drive ending in Welches. The most difficult part of the drive was to Government Camp where the road ended. this photograph were promoting construction of the Mount Hood Loop Highway. 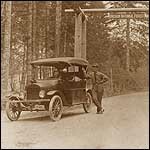 To learn more of the history of the history of driving to Mount Hood, you can read Ivan M. Woolley's book, Off to Mt. Hood, written in 1959, in full online. The online version is scanned from the original book including several photos of early "horseless carriages" making their way along the Mt. Hood Highway during the early 20th century. For more information about the history of Mount Hood, you can also visit: mounthoodhistory.com online or tour The Mt Hood Cultural Center and Museum in Government Camp, Oregon.